Soma over at Whims and Fancies is hosting an online trunk show and I thought I would join in. 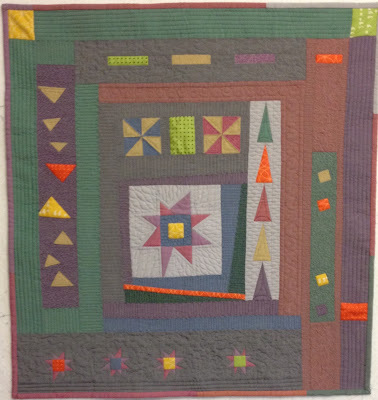 I think my best finish so far this year (and possibly ever) has to be the 50th anniversary quilt I made my parents. The pattern was round and round by Thimble blossoms and I used a Simply Colourful II layer cake and a huge amount of Kona white! The centre block contains my parents photo and around the edge are their five children on their wedding days. I included the 16 grand children under the respective parents too. Somehow I quilted this in a weekend (a tight deadline!) and was sewing the binding down on the aircraft flying to the surprise party. The final stitch were sewn just hours before the party began. There is more about this quilt here. This next quilt was finished a couple of years ago and is another favourite of mine. Made for my son who was a Mario Bros fan. The pattern is by Angela at Cut to Pieces who ran it as a quilt along several years ago. I started making the blocks long after the quilt along had finished or I might have found it easier to keep on track. It took a long time to make these blocks, maybe something to do with the 3888, 1 inch pieces it comprises! I also found this one hard to quilt on my domestic machine, the size and weight made my shoulders ache after a while and it took me well over an hour a block despite chosing a simple stippling pattern! But I am so pleased with it, it keeps him warm and I love seeing it on his bed! You can read more and see more pictures here. 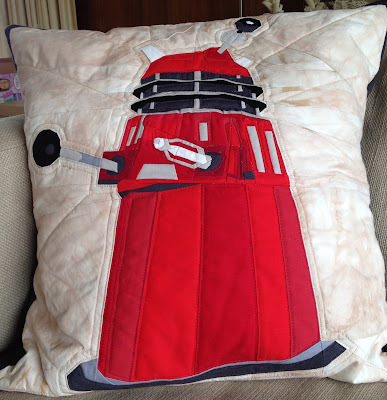 My husband is a big Doctor Who fan and I just loved taking part in Soma (Whims and Fancies) and Caroline's (Trillium Designs) quilt along a while back. I must confess though that I still haven't sewn all the blocks together into a quilt! But I did complete this Dalek block and turn it into a finished cushion last Christmas. Their patterns are great, sometimes challenging, but so satisfying to finish. I am so pleased I have finally finished this quilt (a long term WIP). I has been on the go for quite a few years. I went right off appliqué half way through but picked it back up earlier this year determined to finish it. The pattern is by Lynette Andersen and I just love the reindeers. I quilted the background with an all over loops and stars and it makes the characters stand out more. If you want to see more, it can be found here. My mum and I have been challenging each other to do something new and together for the last few years. The latest challenge was to use some Oakshott fabrics I won in a competition. We each started with a center block (wonky star in my case) and then, a bit like a round robin, sent it to the other to add a section and then swap again. We continued like this until we'd reached a reasonable size. This is my finished wall hanging. I heavily quilted mine just because I like to experiment with new designs. See more here. Well, I think that's enough for one trunk show. I hope you enjoyed the selection. 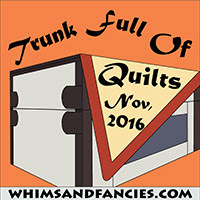 Take a trip to Whims and Fancies to see other trunk shows happening and maybe join in yourself. Thanks Soma for a fun idea! 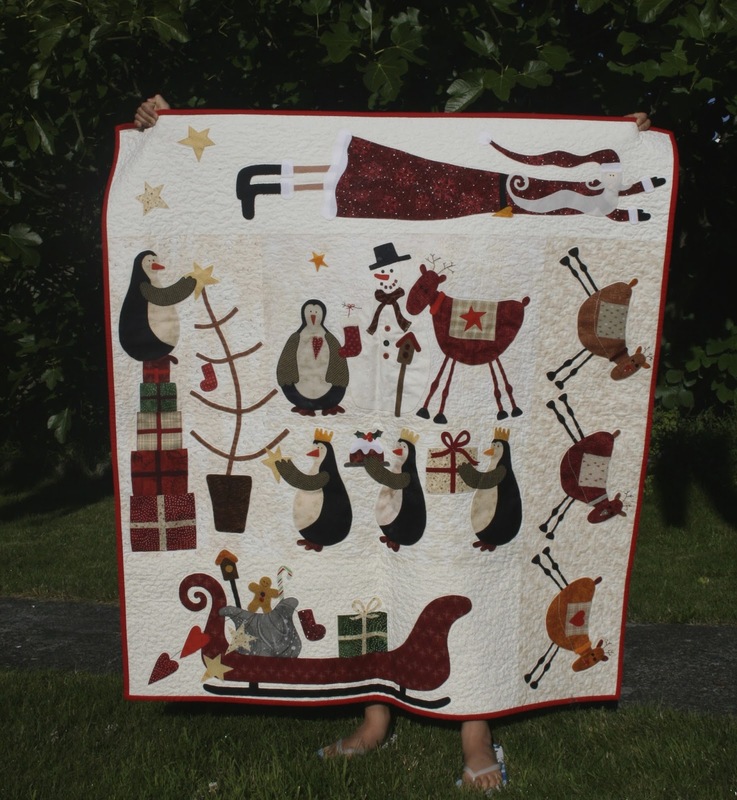 A great Christmas quilt. So good to finish a long term WIP. That Anniversary Quilt is a true keepsake! What a thoughtful gift. Beautiful quilts. 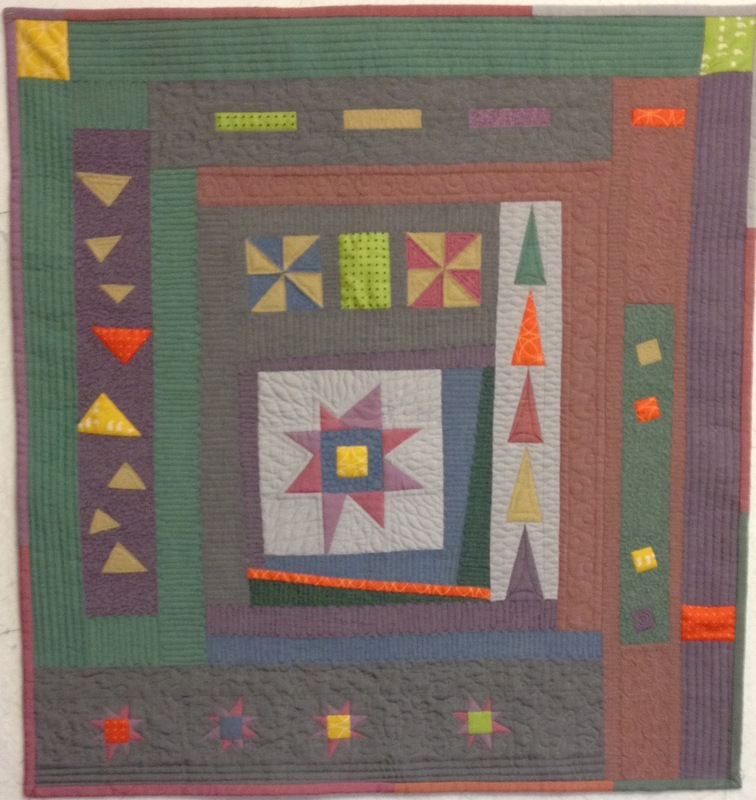 I love memory quilts. The 50th Anniversary quilt is an absolute treasure! Too much fun! What a great mix of quilts! A Dalex cushion, no less - my two boys would both love to have one. Thanks for sharing your talents. What a great cross section of quilts. I especially love your whimsical Christmas quilt. The anniversary quilt is stunning! I'm sure your parents love it very, very much. Thanks for sharing your work as a trunk show. So fun! A great trunk show! I love that you added photos in Wedding Anniversary quilt. Your applique and pp skills are amazing, Jo! I know how challenging that Dalek is and yours is really fabulous. What a beautiful quilt your 50th anniversary quilt is. It looks stunning resting on the bed. So much lovely variation in your work. I have enjoyed looking through your trunk of quilts. I love the variety in your trunk show! Thanks for sharing. The anniversary quilt is stunning, and that Dalek is just great! Oh your friends for christmas is my very favorite!! Great trunk show, thanks for sharing! 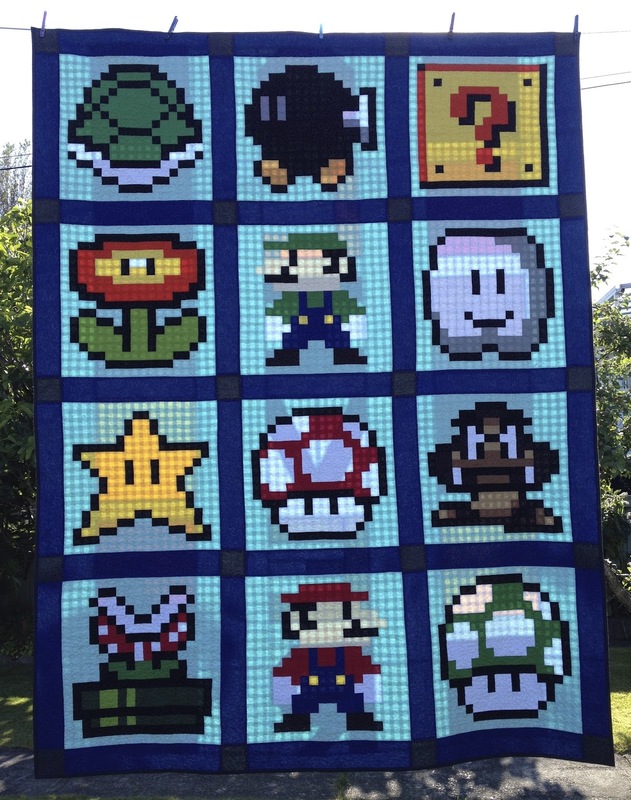 I love the mario brothers quilt. Your anniversary quilt is so special! Love it. Lovely projects, but you anniversary quilt is just awesome - what a special gift. Love them all -- that Anniversary quilt was definitely a labor of love! Just love your anniversary quilt -n your parents must have been thrilled, I'm sure. Your anniversary quilt is awesome! !